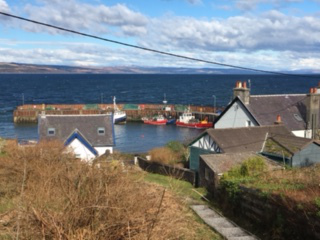 It is impossible to write about every activity, beautiful or interesting place to visit whilst in Kintyre – we have so many! However, we thought we’d include some of our favourite things to see and do to give you a taste of Kintyre and tempt you to come and join us! A 9 hole golf course, Carradale Bay – a mile long sandy beach, the beautiful Port Righ bay looking over to Arran, our wild goats at Carradale Point, the working harbour and wonderful walks in the forest and up onto the hills. In addition to The Ashbank, the village has a well-stocked shop, a post office, The Glen Bar and Restaurant, The Carradale Hotel, Dunvalanree and the Network Centre café. Explore Saddell Abbey and beach, Torrisdale Castle Grounds, seals sunning themselves and pony trekking at Peninver, the Seafood Cabin at Skipness, Tarbert and Campbeltown harbours and sea front walks, the Aqualibrium, golfing at Machrihanish, surfing at Westport beach, great cakes at Muneroy tearooms at Southend and finally, gorgeous Gigha! We have a wide range of guide books and information and are happy to help you arrange visits and excursions.